In this manual, you will find installation and usage instructions for MT4 & MT5 Supreme Edition. The installation process and usage is the same in both versions. 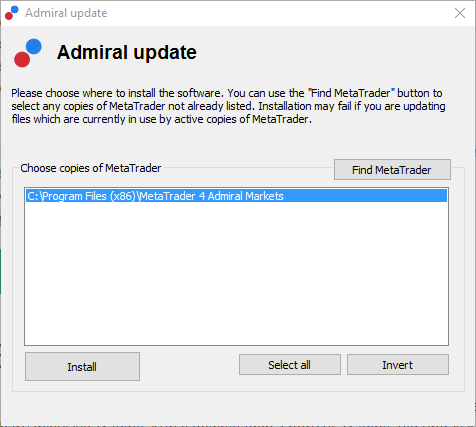 Follow the instructions until the installation finishes, then start MetaTrader 4/5 again. Note that, at this point, MT Supreme Edition functionality is only compatible with Windows. 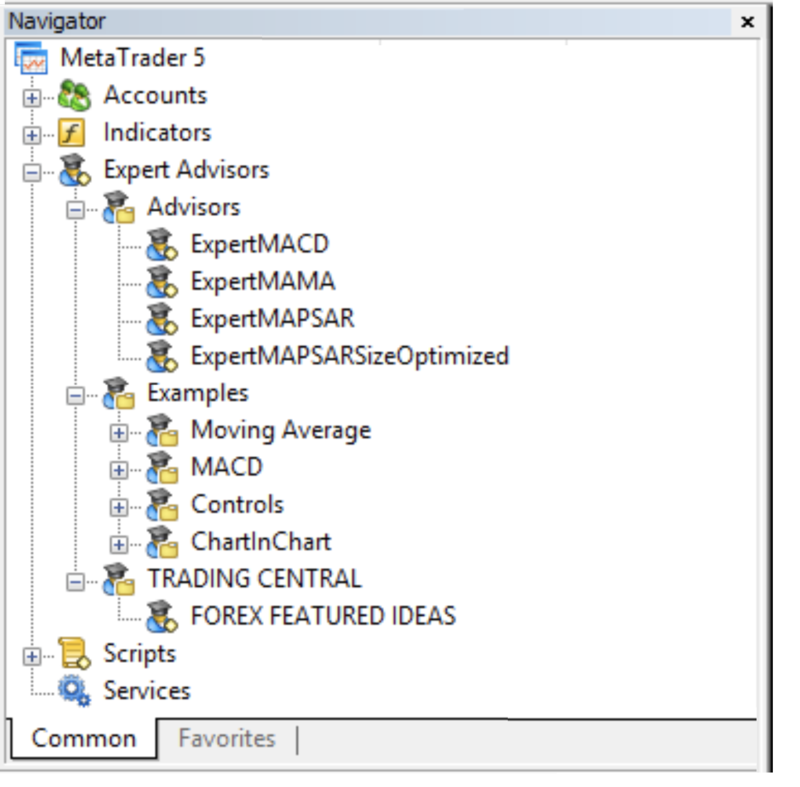 Find Trading Central in the list of Expert Advisor (EA) functions in the navigation window. Right-click it before choosing Attach to a chart from the context menu. Note that you can only run one EA per chart in MT4 & MT5. If an EA is already running on a chart, then adding Trading Central indicators will replace the existing EA. To run more than one EA, simply open more than one chart. The indicator Forex Featured Ideas™ delivers a universe of unbiased, intraday trading ideas detected by Trading Central`s award-winning technical analysis pattern recognition.Tailor ideas to your individual preferred currency pairs, holding timeframes and technical analysis methods with our automated and personalised settings.Time your trades and monitor your portfolio easily, with our updates whenever a significant Technical Event® occurs. Here you’ll find actionable trade ideas detected by our award-winning technical analysis pattern recognition! Customise the filters so you only receive ideas that match your unique trading style and interests. 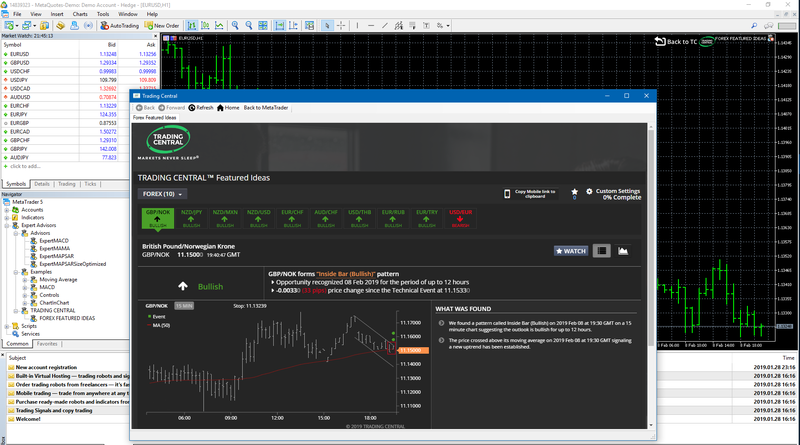 Select your favourite currency pairs, holding timeframes, pattern types and more! Each idea offers a transparent commentary on why this idea was shown and what the technical events mean for the price. Hovering over the pattern will teach you about that technical patterns and "watching" an idea will allow you to keep track of how it performs so you can make a confident, educated decision next time you see that pattern. Technical Insight™ combines actionable, technical analysis on virtually every financial instrument, to help investors optimise their trading strategies. Through a balanced feature set of detailed, proactive analytics, educational guidance and customisable options, Technical Insight™ empowers investors of all skill levels to take control of their investments. Each Technical Event® includes educational commentary and other data about the event and its expected impact on price action. Investors can continue to learn about any instrument through “Learn more” and “View Historical Events” buttons. This progressive disclosure of information allows new investors a jumping off point to begin trading and the ability to continue learning on their own pace. 2. Concise Support, when it’s needed. Technical Summary Score is the little analytic making big changes to how investors interact with the rich information in Technical Insight™. No need to sift through details before making a decision… the Score delivers a concise technical outlook across three timeframes. Using a proprietary weight-of-evidence approach, the Score displays the directional outlook of either bullish, bearish or neutral, across short- to long-term timeframes, to provide simplistic support in the moment it’s needed. Technical Insight™ patented pattern recognition is paired with the industry’s largest library of technical analysis including classic patterns, candlesticks, Elliott Wave and indicators like Bollinger Bands and MACD. This allows you to analyse virtually every publicly traded financial instrument including stocks, ETFs, indices, foreign exchange and futures. Feel free to visit our YouTube channel for live trade recordings, tutorials and playlists of extension-highlights. Disclosure: Admiral Markets Pty Ltd supplies these add-ons free of charge, based on the Expert Advisor technology in the MT4. As with all EAs, these are only active when your MetaTrader has established connection to the internet and our servers. Admiral Markets Pty Ltd has thoroughly tested and convinced itself of their technical reliability. However, as with all technology, malfunction can never be fully ruled out. Make sure you fully understand the functionality of all add-ins and extensions, e.g. by practicing their use extensively with a free demo account of Admiral Markets Pty Ltd. Admiral Markets Pty Ltd can not assume liability for loss or other damage caused by technical complications.